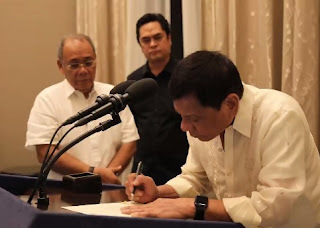 President Rodrigo Duterte signed the Executive Order (EO) on the Freedom of Information (FOI) in the Executive Branch on July 23 at around 7 PM, just two before his first State of the Nation Address. The EO is entitled "Operationalizing the Executive Branch the People's Constitutional Right to Information and the State Policies of Full Public Disclosure and Transparency in the Public Service and Providing Guidelines Thereof." With the signed FOI, the media as well as ordinary Filipinos can now have access to information about the Executive Branch and "all government offices under the executive branch. This includes the national government and its offices, departments, bureaus and also government-owned and controlled corporations (GOCCs) and state universities", according to Presidential Communications Secretary Martin Andanar. 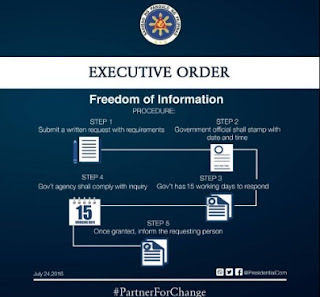 The EO on Freedom of Information embodies the right of every Filipino to access "information, official records, public records and to documents and papers pertaining to official acts, transactions, or decisions as well as to government research data used as basis for public development." The EO further reminds public officials to make their statement of assets and liabilities and net worth (SALN) available to the public. How can a Filipino exercise his right to access information via the FOI? There's no government website which will contain all the information that you want to know, as some people might expect. But, there is a pretty basic procedure that one will have to follow to obtain the information from the Executive Branch. 1. Submit a written request with requirements. The request should include the name and contact information of the requesting party, valid proof of identification and authorization, description of the information requested, reason and purpose of the request for information. 2. The government official shall stamp the request with date and time. 5. Once the request is granted, the government agency will inform the requesting person. The requests for information are basically free of charge, unless a government agency asks for reimbursement of necessary costs like actual reproduction and copying costs of the requested information. Although Andanar said that no request for information shall be denied, there will be some exceptions. The public will be denied access to "information that falls under any of the exceptions enshrined in the Constitution, existing law or jurisprudence." An inventory of such exceptions will be drawn up by the Department of Justice and the Office of the Solicitor-General. The EO states that any erring public officer or employee who fails to comply with the provisions of the FOI order may face administrative and disciplinary sanctions.